An interview with Cy Hungerford of Pittsburgh is a joy—but almost impossible to reduce to type. Because the interviewer's mind just sits there and smiles in recalling the experience. The predicament is not unusual. 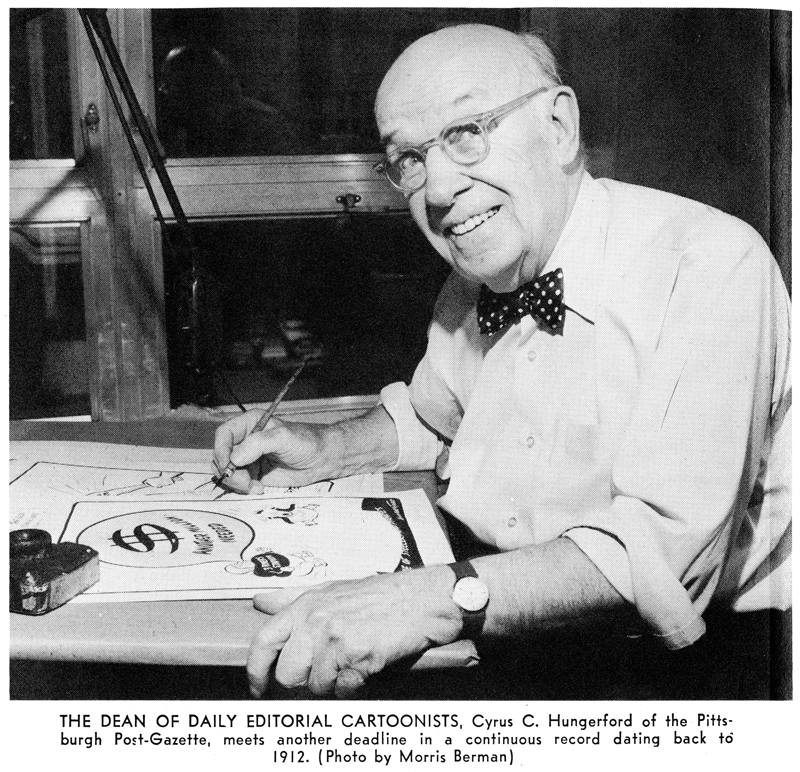 Smiles and chuckles have been standard response from the newspaper reading public in Pittsburgh and environs to Cy Hungerford's daily editorial cartoons or his name for generations. Count on a similar tribute from the cartoonist's peers. Around the editorial offices of the Pittsburgh Post-Gazette, faces light up at the mention of his name— a condition noticed even in the near-by offices of the Pittsburgh Press and at the penthouse bar of the Pittsburgh Press Club, where veterans ply a visitor with off-the-record Hungerford anecdotes. The base of this local pride is wrapped up in the lifetime work and personality of the dean of the country's editorial cartoonists. He's been in print for at least 70 years, from teenager to man—but is cagy about the exact number of this summer's birthday. Few newsmen last so long in the day-to-day deadline game—or are allowed to work so long past that dictatorial 65th anniversary by a doting management. Hungerford is sparkling testimony to the value of exceptions for any rule. But then Cy doesn't fit the routine pattern. In keeping with his own style, he once ran all the way to the courthouse the day he heard he was in libel trouble because of a cartoon. He didn't wait for a subpoena. But at the time Cy was all of 13 years old. And in Parkersburg, West Virginia. The 20th century was not very old either. In this 1973 summer, Cy pauses to look out his office window beyond the Gateway park and sees again that kid who had drawn a cartoon of a man pulling money out of a bank and choking widows and orphans. "I put his right name on it, too. It was libelous as the devil." A kindly district attorney got the youngster out of the clutches of the grand jury. "I don't think Cyrus knew what he was doing." Still scared, Cy ran all the way home to breathlessly tell his mother, "They tried to put me in jail." Mrs. Hungerford, who was to save her only son's cartoons by the trunkful later, didn't panic. She just said, "If you want to continue to do cartoons for the Social Rebel, you do it." And her son kept on. Cartooning is all he ever has wanted to do. While other boys raced out to play after school, Cy raced to the newspaper office "to practice." But he never forgot that early joust with libel. "Never labeled a banker by name after that—especially if he was choking widows and orphans." By the day of high school graduation, he had been a newspaper delivery boy and had drawn cartoons for the Parkersburg Sentinel and the Social Rebel, with time to organize a high school newspaper, The Quill, along the way. His education on the morning paper route along the waterfront was liberal. The route was the "red light" section, and while Cy says he dreaded Saturday morning collection duties, he gleefully acts out the calls of the ladies, "Little boy, come in ... come sit on my lap ... heat the needle for me." Fresh from Parkersburg graduation, Cy got a job at the Wheeling Register with an afternoon reporting beat including the old shoemaker and the fire station. "Most of my items were not publishable." Then he got his chalk plate cartoon done by midnight. At Parkersburg he had taught himself to engrave cartoons on chalk plates—drawing on paper, tracing, and blowing out the chalk dust as he chiseled down to steel. There could be no rubbing out—a mistake ruined the plate. "Not bad work for a kid of 21 in chalk— got so good it would look like pencil," says Cy of some yellowed cartoon clips in a photo album he has carried down to the office in a brown paper bag. Cy stayed four years in Wheeling, which time was not all work. He "fell in with the editor’s son, a holy terror ..." Bud Taney and Cy formed a partnership in the fun and games department including joint ownership of a canoe. Up to Wheeling, Cy had never had a drink and was now blessed with $20 a week. "I don't know if it was good for me or not— Dorothy says it wasn't," Cy muses. Dorothy' is Cy's second wife, a pretty, white-haired grandmother, who brought five grandchildren into the Hungerford family circle. They were married in 1966, her first husband Arthur Goetz having died in 1965, and Cy's wife Alice having died in 1964. Before their marriage, she was often introduced as C. H.'s friend. So now, in order to avoid attendant fuss over being Mrs. Cy Hungerford, she sometimes makes appointments as Mrs. C. H. Friend. Quick of step and pixie-eyed, C. H. arrives at the office late mornings, Monday through Friday. He has an "awful habit of waking early" and is usually waiting at his apartment door for the paper delivery at 4:30 a.m. As a rule, he has a cartoon idea before he leaves for the office. Sometimes it's discarded for another. "The idea that comes quick is the true one." A lot of good cartoon ideas seem to happen around 7 a.m."
"A funny life ... in a way hard and in a way easy ..." is this business of working with the clock. "Most cartoonists don't believe that I never worked with an editor and that the editor of the page didn't know what I was doing until he opened the paper ..." Later, Cy amends that with, "Well, there was one suggestion of 'why don't you ... ' but it didn't come off too well." "It's not too hard to think up an idea," but Cy adds critically that he doesn't think the ideas are as good as they used to be. To which a colleague throws up his hands in protest upon hearing that repeated. The cartoonist who has drawn every President since Teddy Roosevelt has the tool of a gentle, humorous slyness. But he's never savage. The iron stand for his drawing board he's used since 1915. It once belonged to the city editor of the Pittsburgh Sun. And the old wooden ink well—from which it is impossible to spill ink even by turning it upside down—is well taped together, an inheritance from cartoonist Sidney Smith, who went off to fame and fortune as creator of the Gumps. 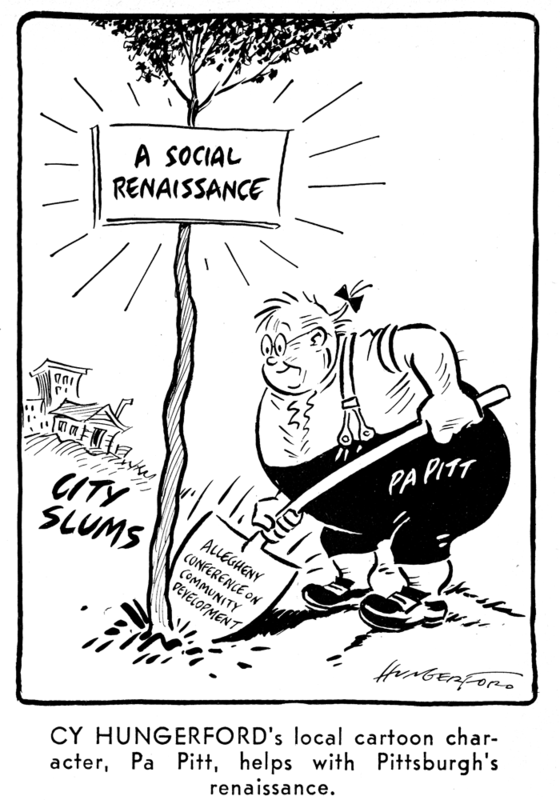 Cy's love affair with Pittsburgh—and vice versa—had its beginning in 1912 when he got the cartooning job on the Sun. By then he had worked in chalk so long it was hard to do pen and ink, a fact which led him to bold brush strokes which characterize his work to this day. His characterizations of officials and celebrities—local or otherwise—are consistent. And the famous have always been writing for originals. John L. Lewis was "constantly writing," the only one to send a check with a letter. Presidents ask for originals—a peek at a desk drawer solidly lined with letters tucked in envelopes reveals "The White House" return address frequently. When General Patton was killed at Christmas time, Cy drew Santa Claus coming out the hospital door with a black arm band. Mrs. Patton not only wrote an expression of thanks but one day walked into the office to see the Cy. He was away at the time. J. Edgar Hoover was a Hungerford cartoon fan and wrote him perhaps a dozen fan letters. During World War II Cy and a friend, George Sherman, got into the war poster business. Every week for 2 years, he painted a new one—they all stand up today as strikingly beautiful posters, painted with transparent water color stamps not available now. But Cy has a few tucked away. Their over-eager salesman was on the road boasting that Hoover and the FBI liked the posters (which they did) and one day the phone rang and a stern voice said, "Mr. Hungerford, the FBI is not in the poster business. You've got this salesman out in ..."
"If you can create a character: wonderful. People get to look for it." Pa Pitt is a long-established Hungerford character, useful in local affairs. Newspaper fellows aren't the colorful characters they once were, says this authority on the subject, but then neither are there such colorful characters in public affairs. "Now, with the exception of Pete (Pittsburgh's Mayor Flaherty), no one creates a flurry around here." Cy had a comic strip "Snoodles" in his repertoire from 1914 to 1928. He was doing it for nothing in the Pittsburgh Post—just because it was fun. George Matthew Adams Service of New York took the strip on, and Cy did 6 a week until he got tired of it. Of the Sun/Post shared city room, Cy says the two staffs despised each other. They stole scissors and typewriters from each other regularly. The Sun's city editor had a bowl of goldfish on his desk, admiring them mightly. So, naturally the Post fellows brought in a cat. The rivalry got so bad that a screen had to be erected. 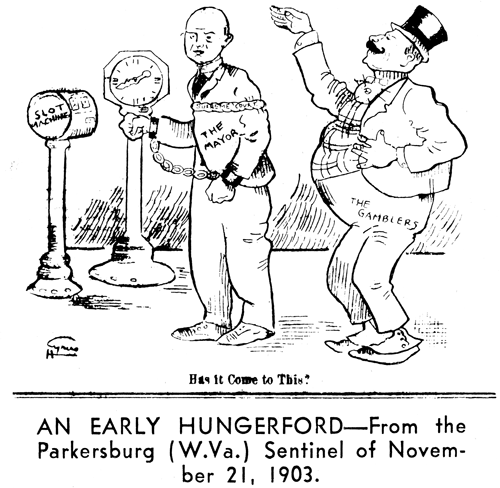 When a Pittsburgh newspaper merger took place in 1927, Hungerford joined the Post-Gazette and for many years his editorial cartoon was on page one. When publisher William Block told Cy he wanted to move the cartoon to the editorial page, Cy frankly said it was a mistake, but still "I got my start on the editorial page." In 1937, Paul Block Jr. and Cy made a European tour stopping off for King George's coronation, and such is the Hungerford magic that he met a fellow sorting mail at the royal stables and eventually ended up going to the royal ball via the servant's entrance. In Rome, he came by a private audience with Pope Pius XII in 1947, and found himself talking with the Pope about his wire-haired terrier Jiggs, an ornery dog who bit everybody. Cy is a man not given to having his picture taken, but he agreed to sit for a new photo for E & P. As Post-Gazette staff photographer Morris Berman neatly manages to get a whole roll shot, Cy is warming to the task with surrounding critics. Suddenly, as Berman says "That's it," Cy shoots across the floor in his chair, picks up the phone and cries, "Hello, Hollywood? No, I can't fly out today. I'm too busy. Maybe tomorrow." That's Cy Hungerford—Indiana-born, over 80—who enjoys the Now but fondly holds in his memory the experiences of a newspaper lifetime spent enjoying and observing the foibles of his fellowmen, himself included. The smiles and greetings that accompany his walks, he receives gracefully. Even getting through the lobby of the Hungerford's apartment house en route to the Press Club for dinner brings a gauntlet of smiles, good-evenings, and waves from a big circle of sitters. One woman, fairly bounces up and down with excitement: "I just got back from Florida—missed your cartoons." Cy bestows a smile and keeps walking with his wife and interviewer. At the door, the lady flings her accolade, "Best thing on the editorial page!" "Don't know if I should use that one," says interviewer. 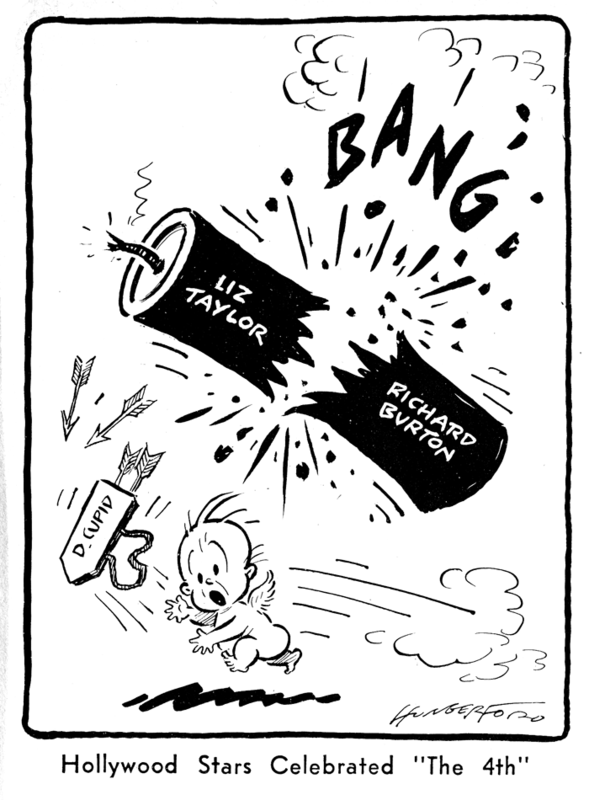 "If you do," chuckles the cartoonist, "I'll mark it in red and put it on Bill Block's desk." On rare occasions, I've found some of the yearly collections of cartoons that used to be published by the Post-Gazette. The five I have all date from the late 40s or early 50s.